Burbank, CA – The much anticipated “anti-bullying” film, the Martial Arts Kid, makes it way into DVD/Blue Ray distribution this month. Released in 2015 by Traditionz Entertainment, the Kid stars martial arts all-time greats Don “the dragon” Wilson and Cynthia Rothrock who combined have over 100 screen credits. A portion of the DVD sales was donated to the Martial Arts History Museum this weekend as the announcement was released. 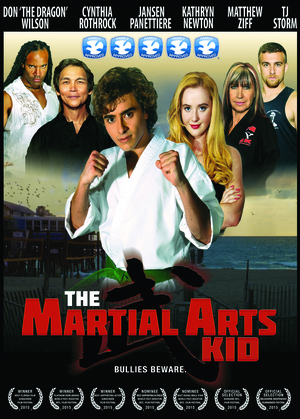 The Martial Arts Kid revolves around a young troubled teen Robbie Oakes (Jansen Panettiere) who moves to Florida to live with his Aunt Cindy (Cynthia Rothrock) and Uncle Glen (Don Wilson). He encounters trouble upon his arrival and is immediately picked on by the school bully. Lucky for Robbie, his Uncle runs a local karate studio. Although it is a quintessential good versus evil tale, it is also a coming of age movie in which Robbie learns from his Uncle how to be a better person. The Martial Arts Kid, which also includes TJ Storm and Kathryn Newton, adds a flair of nostalgia as it inserts cameos of some past martial arts icons and pioneers. “The museum is very grateful for the support of Traditionz Entertainment. Although there have been many tribute martial arts films in the past, giving back is more than just inserting modern versions of an old movie. The museum was built by the entire martial arts community and giving to the museum is supporting all those movie-goers,” adds Matsuda. The Martial Arts Kid DVD and Blue-Ray are available at http://www.martialartskidmovie.com/shop/ with a special price for bulk orders for schools. The Martial Arts History Museum is located at 2319 W. Magnolia Blvd., Burbank, CA 91506. Website is Mamuseum.com. The museum is a non-profit 501c3 organization and is supported by donations, visitations and memberships.